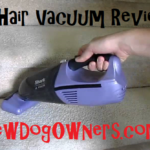 Home » Dog Product Reviews » Review: Does the FURminator Really Work? Review: Does the FURminator Really Work? Everyone loves their dogs like family, but not necessarily the fur that comes with owning a dog. 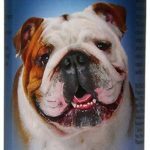 Many dog owners feel that they are constantly brushing their dogs, vacuuming and sweeping their homes, and still this is not enough to combat the massive amounts of hair throughout their home. Some opt for so called hypoallergenic breeds such as Poodles or the Bichon Frise which do not shed nearly as much as most dogs, however these particular breeds are not for everyone. 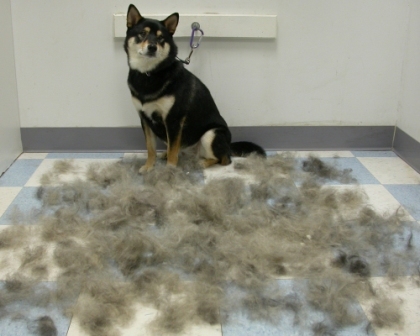 If this sounds familiar, than you might want to invest in a FURminator DeShedding Tool. The FURminator is a grooming tool that was created by Angie Porter, a professional pet groomer, whose quest to find a quality, invaluable tool to deal with dog shedding ended with her creating one of the most coveted brush on the market. They have now expanded to also include a large variety of grooming tools for both dogs and cats and everything from shampoos, conditions, and even a FURminator vacuum attachment so you can essentially vacuum the hair right off of your pet! There are 2 layers to the canine coat- the top coat and the under coat. Each hair has a life cycle just like human hair, and typically takes 4-6 weeks to complete depending on breed and species. The undercoat is usually the main problem of shedding and is the majority of hair that you see flying around your house. The FURminator works by getting past the top coat, and removing the dead undercoat. Although the brush does have sharp metal teeth, it does not cut or damage the hair in anyway. There are a few restrictions for this style brush. 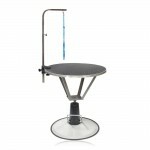 It must be noted that this is only meant for dogs that shed. If you have a pet that is considered hypoallergenic then that means that they do not have coat that sheds like a normal dog. 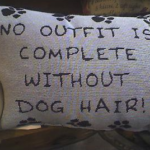 Instead their hair grows like human hair grows and does not shed nearly has much as your stereotypical dog. These dogs need to see a groomer regularly for trimming and do not need to be brushed as frequently. This brush is not intended for daily use, and is best used 2-3 times a week at most. This is because if you use this brush so often that your pets coat is at the point where it barely sheds, then the FURminator will start to pull out the living fur which can cause baldness. This is also only meant to be used on the main part of the dogs’ body, not on the belly or anywhere where the hair is naturally thin. This is because the skin in these areas are fairly delicate, and since the teeth of the FURminator are pretty sharp there is a chance that you could damage your pets skin. Although this brush is on the pricey side (varying in price from $20-$40 depending on the size of the brush head that you choose), it has a life time warrantee, meaning that if it is damaged, breaks, or if the teeth of the comb need to be replaced, than it is covered under the warrantee. You essentially never need to buy a new brush ever again! If you have been struggling to combat your pets constant shedding and the mounds of fur that are constantly flying around your home, than I encourage you to give the FURminator a try. It is a wonderful, high quality grooming tool that I am quite certain will quickly become a constant part of your grooming routine. I thought it would be good to share a video on how to use this tool. It is pretty straight forward, but videos always help. «What Can I Catch from My Dog? Zoonotic Disease!